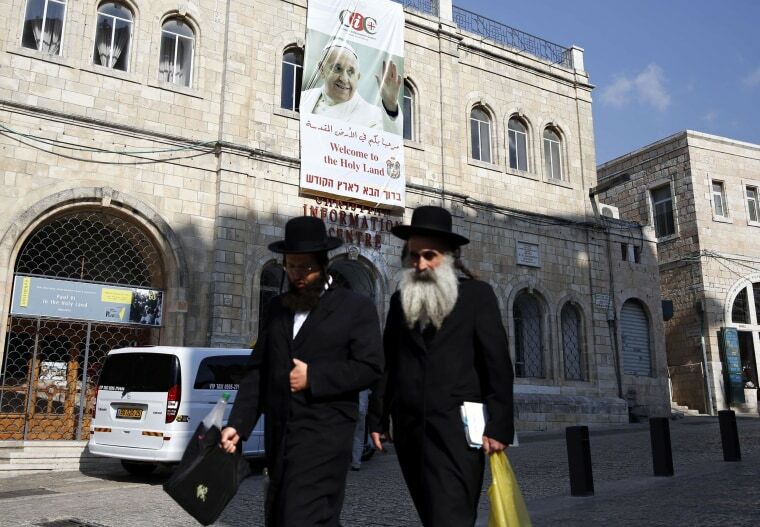 JERUSALEM, Israel - More than 200 Orthodox Jews protested on Monday against the pope's planned visit to the site where Christians believe Jesus Christ had his Last Supper. The Cenacle, a building on top of Mount Zion outside Jerusalem's walls, has resonance with all the Abrahamic religions. For Jews, it is the Tomb of King David and it is also the site of a 16th-century mosque. This controversy comes on the heels of a string of vandalism attacks allegedly perpetrated by far-right Jewish groups on Christian sites in the holy city. Several Christian churches have been defaced and the top Roman Catholic cleric in the Holy Land said the spate "poisons the atmosphere of coexistence." Fourteen attacks by suspected far-right Israelis have been reported in the past year, according to Reuters. Several have been carried out over the last month, including a death threat daubed in Hebrew at the Assembly of Bishops at the Notre Dame Center in East Jerusalem, where the pontiff is due to meet Israeli Prime Minister Benjamin Netanyahu.